We have carved a niche amongst the most reliable names in this business, involved in offering a supreme quality range of Men's Cummerbund to our customers. We make use of supreme quality fabric that is sourced from reliable vendors of the market. 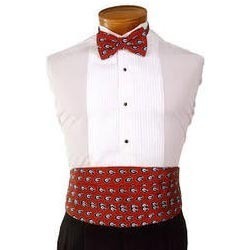 Our client’s can avail this offered Men's Cummerbund in various sizes and designs. ACE Apparel Co. is the premier manufacturer and supplier of Neckties and Men's Clothing Accessories in south of India. In the business for over twenty years, we manufacture Neckties and accessories under two brand names, Tie Range and Eric James. The two founding characteristics, that still guide us today, are: delivering quality and delivering optimum value for money. Ace Apparel Company caters to, besides retail clientele government sector, public sector undertakings, corporate, clubs & schools and have been privileged to have catered to Madura Garments, Paramount Airways, Indian Bank, Torrent Pharmaceuticals, Crompton Greaves, Reserve Bank of India, National Defense Academy Madras Cricket Club, amongst many others. We remain grateful for the unflinching support of our clients, customers and retailers. Their satisfaction remains our priority.